Slip into summer mode in the Jack by BB Dakota Chambray Wishes Light Blue Tie-Waist Shorts! These fun little shorts, made from breezy and lightweight woven fabric, will have you feeling cute and comfy this summer with their elasticized and belted high-waist cut and twin diagonal front pockets. 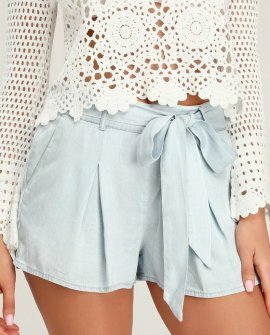 More cute details, like front pleating and back patch pockets, give these shorts a put-together yet effortless feel!